Green Tour Kyoto is ..
people who look at this site from all over the world. 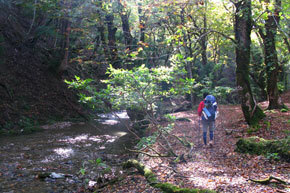 We would like to introduce the nature aspect of Kyoto and offer the new green hiking tour in Kyoto. You can enjoy hiking the surrounding mountains, and satisfy your five senses such as breathing the fresh air in the mountains, listening to the sounds of the trees in the breeze, birds' songs and smell the wet leaves.., and then you get down and visit the temple or shrine located at the foot of mountains. How do you feel about such an ecological and healthy tour? GTK proposes it to you! Who is Green Tour Kyoto? c.coquet -communication service- and Factory MOHAN. The managing director, Chikako Takemoto, is also the director of c.coquet and "journal Kyoto", which is a free magazine for the visitors in Kyoto. Chikako moved to Kyoto from Tokyo to open her cafe in 2002. 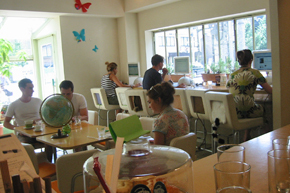 A lot of foreign travelers visited her cafe to enjoy a coffee, internet and talking to her about the idea of their traveling in Kyoto. She realized that the information for the foreign travelers was insufficient, so she started editing the monthly magazine for them in 2007. While working as the editor, she realized again that Kyoto is world famous for only its historical and traditional aspect or geisha! 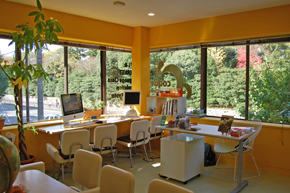 In the end of 2009, she decided to produce a new style website to introduce a natural aspect of Kyoto to the world with her friend, Yusuke Miyamoto. Yusuke is a professional web-designer and also an outdoor man who loves the mountain trekking, cycling, camping etc. He told her that he enjoyed walking around Kyoto along the mountain routes, and visiting the temples or shrines at the foot of the mountains. It seemed to be quite interesting for the visitors. Besides it's so healthy! Chikako, Yusuke and GTK friends are pleased at making their green website and helping the visitors' healthy and unforgettable stay in Kyoto.